This page describes how to use and configure the Dojo Treemap. Treemaps display data as a set of colored, potentially nested, rectangular cells. Treemaps can be used to explore large data sets by using convenient drill-down capabilities. They reveal data patterns and trends easily. Treemaps rely on data clustering, using areas and color information to represent the data you want to explore. An example of a treemap is shown below. The treemap shows business sectors at the head of the hierarchy and provides the possibility to drill down to country and then company level. 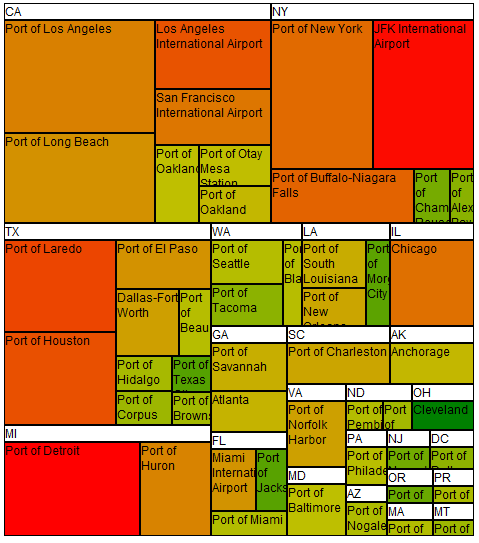 Map the size, color, and label of treemap cells to properties in a data store. Choose either a predefined algorithm for computing the item colors or specify a color using a customizable color function. Specify the treemap levels at which labels are to appear. Get an event when clicking and hovering over treemap items. Navigate within a treemap with visual effects on drill down. Note: The treemap is not supported on Internet Explorer 6. On IE7 and above a standard doctype must be set on the page that includes the treemap. The TreeMap can connect to any implementation of the dojo.store.api.Store interface that implements get/query and id management (getIdentity). It supports flat data and optionally creates a hierarchy from this data using attributes of the data to group them based on certain criteria. In this example the data are mapped from the data store using an attribute based mapping. That means the cell size and color as well as the grouping are extracted from attributes value in the data. For the cell colors in the value of the binding is used as an input into the specified color model. In this case this is a color model that returns a color interpolated between the red and green colors with a mean neutral value. One can specify his one color model like a similar one based on average neutral value instead of mean neutral. If no color model is specified at all the color is expected to be found directly in the value of the colorAttr binding as a suitable input for the dojo/Color constructor. the labelAttr that binds the cell labels to a data attribute. the tooltipAttr that binds the cell tooltips to a data attribute. In this example the data are mapped from the data store using custom functions. That means the cell size and color as well as the grouping are computed by functions specified by the application. The example is very similar to the previous one, except that it is using a function to compute the input value for the cells color. In this case instead of using the absolute profit figure we are computing the profit percentage. The example is also leveraging the query attribute that allows to reduce the scope of the query made onto the data store in order to extract a subset of the data. Here we are choosing only data items with sales above a given threshold. Obviously functions are also supported for binding areas, labels or tooltips. In addition to the mapping properties the TreeMap widget provides other interesting properties. the labelThreshold property corresponds to the maximum depth level at which labels will be displayed. If you want no labels to be displayed, choose 0, if you want only top level labels choose 1 and so on. the selectionMode property corresponds to the type of selection you want to enable on the treemap, possible values are “multiple”, “single” or “none”. the selectedItems property is the array of selected items. If you want to select only a single item you can alternatively used selectedItem property. The TreeMap widget generates HTML markup that can be styled using CSS. The treemap provides a default TreeMap.css that must be included in your application. Alternate rendering can be achieved by overriding some of the CSS rules and using the classes put by the treemap on the HTML elements. Other styling can be performed like changing selection border color or adding margins between the cells. dojoxTreeMapHeader: the TreeMap grouping div header class. dojoxTreeMapHeader_*level*: the class for header of level level. dojoxTreeMapGroupContent: the TreeMap grouping div content class. dojoxTreeMapGroupContent_*level*: the class for content of level level. dojoxTreeMapSelected: for selected TreeMap cells. Other interaction must be explicitly mixed in the TreeMap in order to be available. Right/left arrow keys Select a neighboring item that shares the same parent item. Up/down arrow keys Move up or down in the hierarchy to select a parent or child item. By default each cell is drawn with a fixed size label. As demonstrated in the Styling the treemap one can leverage CSS to change the default rendering like changing the font size. However some more complex customization might not be possible with CSS, that’s why the TreeMap widget conveniently propose classes that can be mixed in the TreeMap class and will provide alternate rendering. itemRollOver Indicates that the user rolled the pointer over a cell in the treemap. itemRollOut Indicates that the user rolled the pointer over a cell in the treemap. A demo is leveraging the Dojo treemap to explore Dojo Trac bug base. Check it out here.